Cambridge Summary: We are off to a rough start with Inventory for January remain quite low, less 48% compared to the same period last year. ~ Condo listing $ volume is down 42% from 84 million to 48.5 million in value. Very little improvement from December. ~ The median list price rose by 9%with properties selling at about the same rate, taking an average of 4.5 months to either go U/A or off market. ~ The number of condos that went under agreement was down by 15. 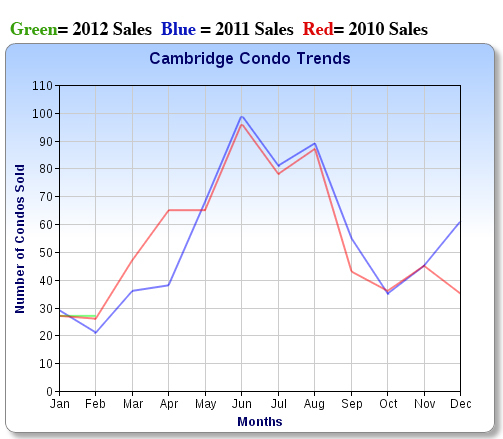 Cambridge condo sales dropped 13%. Sold $ volume was down 32% from 17 to 12 million. 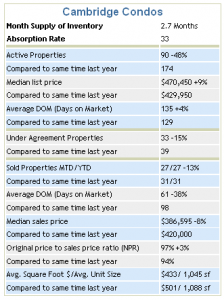 ~ The median sale price dropped 8% with the ratio of sale price to original price reflecting the limited inventory at 97%. ~ The average square foot price for January was $433 per square foot with the average living area at 1,045 sf compared to $501 per square foot with an average unit size of 1,088 square feet in 2011.